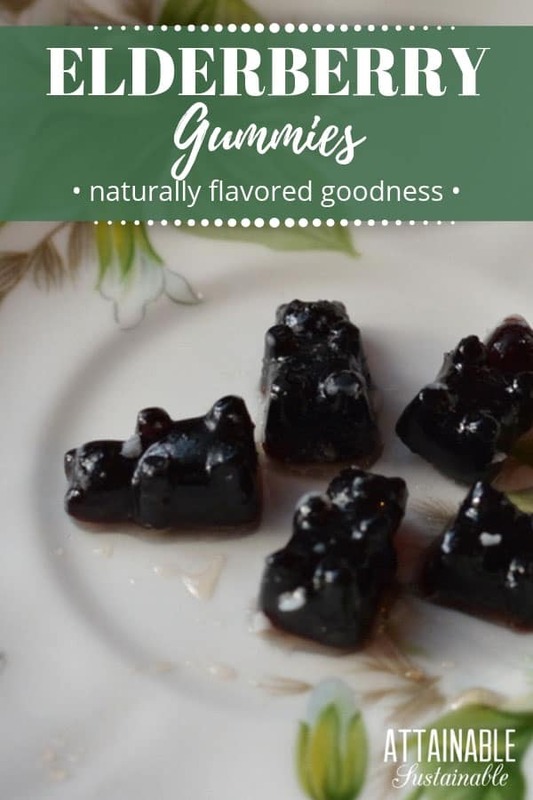 Give this recipe for elderberry gummies a try! They’re a great way to enjoy some healthy elderberry benefits — they fight colds, flu, and bacterial infections — without coaxing. When my daughter, Sarah, was a toddler she loved picking up tiny things with her fingers. She had the uncanny ability of finding tiny gold safety pins in a bowl of white rice, blindfolded. 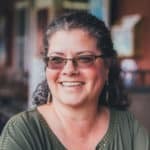 When she ate her dinner, her favorite foods were rice, peas, and corn that she could pick up with her dexterous fingers. But when she was under the weather it was hard to get anything in her mouth. I’m sure if you’ve lived with a toddler you can relate. 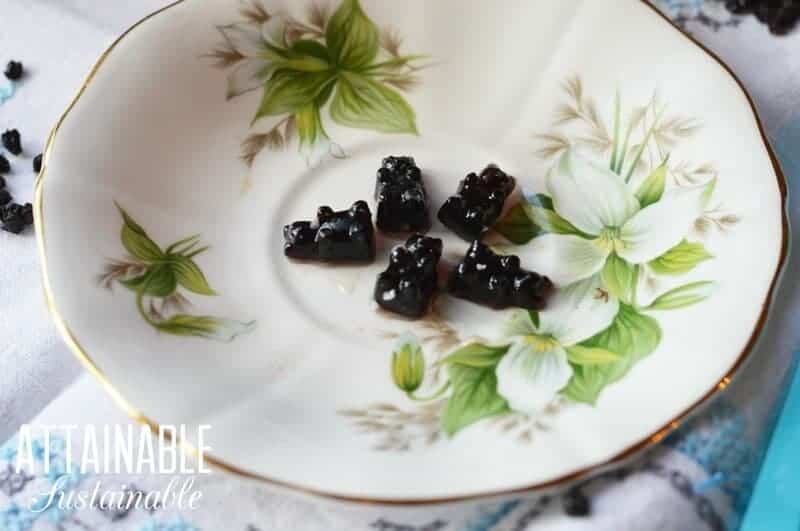 These elderberry gummy bears are designed for those times when a toddler needs a little coaxing to eat something good — something that may help them feel better quickly. These elderberry gummy bears are just the right size and the right flavor to get into a toddler who is under the weather. 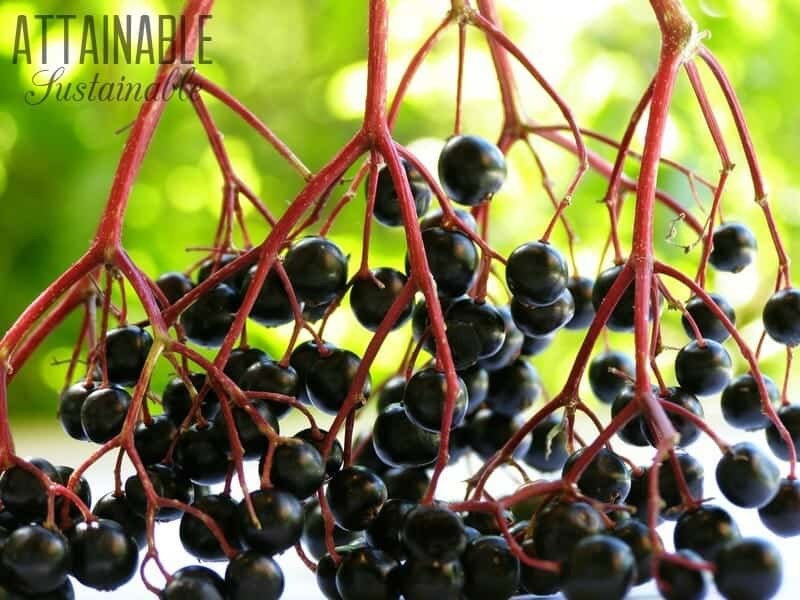 Elderberry benefits include improved hydration and soothing the stomach. Elderberries have superpowers. They help fight colds and flu by preventing the virus from replicating in the human body. Numerous studies have been done to confirm this effect. Elderberry extract seems to shorten the duration of a cold or the flu by three or four days. That’s a better result than Tamiflu which reduced the duration of influenza by only one day. Plus Elderberry extract has no side effects. Elderberries are food. Elderberries have also been shown to benefit the immune system against bacterial infections, including strep. (See the references below if you want to dig deeper.) Even if no one in your family is sick, it’s a good idea to consume elderberry regularly to combat the bugs that are going around and keep your family healthy. Like that spoonful of cod liver oil that our ancestors used to swallow with squinty eyes and puckered lips, it might be a good idea to take a spoonful of elderberry every day during cold and flu season. 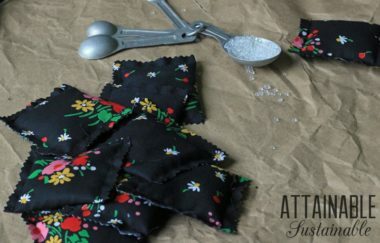 These yummy elderberry gummies have a bit more sugar than elderberry syrup but they are easy to take and even fun – and the serving size is small. Make a batch and serve them up to your tribe. Elderberries aren’t just for toddlers, of course. In addition to this elderberry gummies recipe, you can make elderberry syrup just like the store bought Sambucha™, at home. Here’s my recipe. You can also make Elderberry Jello Cups for dessert for older family members. Many adults also enjoy elderberry mead, elderberry wine, or elderberry vinegar (use this method). If you don’t have the benefit of elderberries growing fresh near you, you can find dried elderberries at your local health food store or online at Mountain Rose Herbs. Elderberry benefits: These berries fight colds, flu, and bacterial infections. 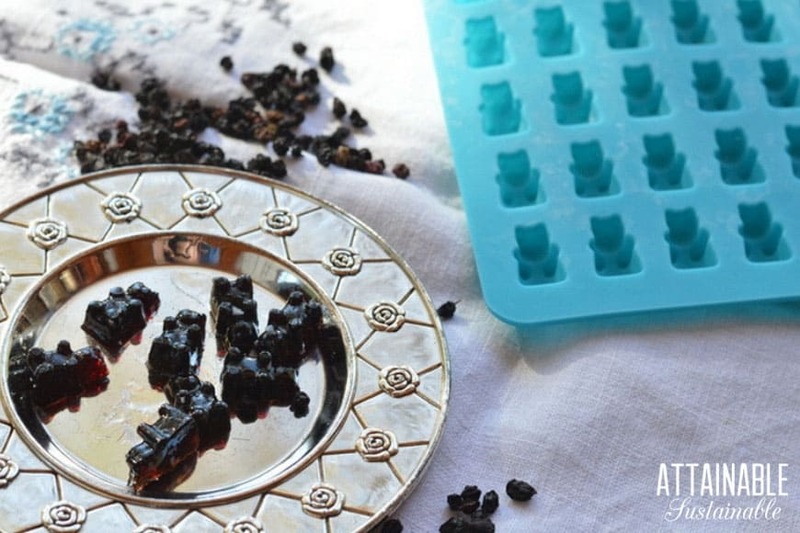 Make these elderberry gummies for your family's health. Place the elderberries and three cups of water into a two-quart saucepan. Simmer over medium heat for 40 minutes. Remove from the heat. Strain out elderberries and return the juice to the saucepan. Return the saucepan to the heat. Reduce the elderberry juice to one cup over low heat. Do not let the juice scorch. Add honey and sugar to the hot juice. Simmer the sweetened juice for 20 minutes. Remove the saucepan from the heat. In a separate bowl sprinkle the gelatin over the remaining half cup of cold water. Allow the gelatin to bloom for five minutes. Stir the gelatin into the hot juice. 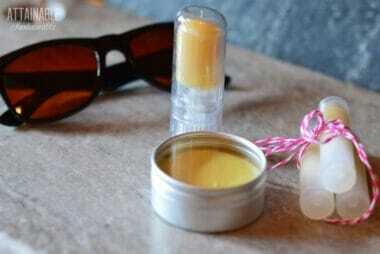 Meanwhile prepare the silicone molds by greasing lightly with coconut oil, olive oil, or butter. Or you can use a cooking spray for this part to save time. Add the prepared gelatin to the elderberry juice. Stir to fully dissolve the gelatin. Fill the molds. This makes 300 gummy bears which is enough for six molds. Place the molds in the fridge or in another cool place overnight or for four to six hours. Remove from the mold. If they are fully set they should pop out easily. Roll in organic sugar if desired. Store in airtight container. Will keep in a cool, dry environment for two weeks. If desired they can be kept in the freezer to prolong their shelf life. These gummy bears have ¼ teaspoon of elderberry syrup plus healthy gelatin. Average serving is four gummy bears three times a day during cold and flu season. The dose on a bottle of elderberry syrup is 1 teaspoon three times a day for prevention of colds and flu, and one teaspoon every two hours during a cold or flu episode. Children under five should take a half serving. Children who are not used to solid food would be better to avoid gummies as they could become a choking hazard. This shouldn’t be construed as medical advice. Consider this information as one mom talking to another over a cup of tea. Talk to your medical professional for any health concerns. Barak, V., Halperin, T., & Kalickman, I. (2001) The effect of Sambucol, a black elderberry-based, natural product, on the production of human cytokines: I. Inflammatory cytokines. European Cytokine Network. 12(2):290-296. Hearst C, McCollum G, Nelson D, Ballard LM, Millar BC, Goldsmith CE, Rooney PJ, Moore JE, Rao JR: Antibacterial activity of elder (Sambucus nigra L.) flower or berry against hospital pathogens. Journal of Medicinal Plants Research. 2010, 4: 1805-1809. Kinoshita, E., Hayashi, K., Katayama, H., Hayashi, T., & Obata, A. (2012) Anti-influenza virus effects of elderberry juice and its fractions. Bioscience, Biotechnology, and Biochemistry. 76(9):1633-1638. Liu AL, Wang HD, Lee SM, Wang YT, Du GH: Structure-activity relationship of flavonoids as influenza virus neuraminidase inhibitors and their in vitro anti-viral activities. Bioorg Med Chem. 2008, 16: 7141-7147. Roschek, B., Fink, R.C., McMichael, M.D., Li, D., & Alberte, R.S. (2009) Elderberry flavonoids bind to and prevent H1N1 infection in vitro. Phytochemistry. 70(10): 1255-1261. Zakay-Rones, Z., Varsano, N., Ziotnik, M., Manor, O., Regev, L., Schlesinger, M., & Mumcuoglu, M. (1995) Inhibition of several strains of influenza virus in vitro and reduction of symptoms by an elderberry extract (Sambucus nigra L.) during an outbreak of influenza B Panama. Journal of Alternative and Complementary Medicine. 1(4): 361-369. 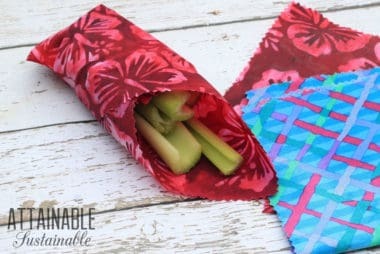 Great recipe and easy to make.